Sleep apnea death is rare. While death from sleep apnea itself is not very common it is associated with conditions that can shorten your lifespan. Heart disease is the most common cause of mortality in severely affected patients. The low blood oxygen levels contribute to high blood pressure and eventually heart failure. To complicate matters, many sufferers are overweight or obese. They lead inactive lifestyles, which further increases the risk of heart failure. If you or someone you love is affected by the condition, the first step is to seek treatment. Doctors may recommend weight loss, lifestyle changes, medications, surgery, oral appliances, airflow machines, pillows, etc. In other words, the treatments are many that can help you avoid a sleep apnea death. 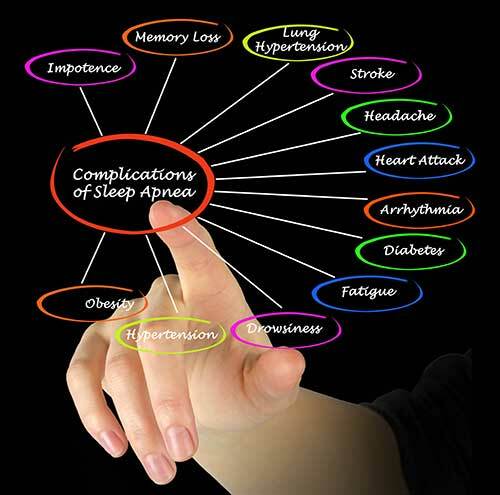 There are three different kinds of sleep apnea; obstructive (OSA), central (CSA) and complex or mixed. Obesity is most commonly associated with OSA, the obstructive type. The excess weight puts extra pressure on the lungs and heart. A buildup of fat around the neck area can contribute to collapse of the airways. Being overweight or obese does not play a role in the central CSA type. Less than 1/2 of one percent of all cases are pure central apneas. Only about 15% are complex or mixed. The other 84% are obstructive. While deaths caused by sleep apnea are relatively rare, complications can lead to fatal outcomes. CSA could cause sudden death from sleep apnea. In this type, damage has been done to the respiration control centers of the brain or the respiratory control centers are undeveloped. In either case, the normal drive that causes inhalation is absent. Normally, oxygen and carbon dioxide receptors in the blood stream send nerve impulses to the brain. When the brain receives the signals, it sends out impulses that cause the larynx to open and the chest cavity to expand. As the chest cavity expands, a partial vacuum is created in the lungs and air rushes in through the upper airways to fill the vacuum. In CSA, the brain does not respond to changing blood gas levels. It could be a malfunction of the receptors in the bloodstream, but most experts believe damage to the respiratory center of the brain is to blame. If death from sleep apnea were to occur, it would be due to brain damage. The brain’s cells need constant oxygen to survive. Drowning, choking and smothering kills by killing brain cells. A lack of oxygen to the brain for an extended period of time can cause severe brain damage. Even if reviving the patient is possible, sometimes the brain cannot recover. Fortunately, CSA is usually a chronic condition. After a few missed breaths, the brain kicks back into action and the person breathes normally. Although sudden sleep apnea death is rare, the chronic nature of CSA can do minor damage to the brain leading to memory problems and learning disabilities. Damage to the other organs of the body can occur as well. All of the cells of the body need oxygen to survive. In addition to heart disease, all three types of sleep-related breathing disorders are associated with an increased risk of high blood pressure, stroke and diabetes. Because of those risks, doctors say that there is an increased risk of “premature” death from sleep apnea, meaning that a person might not live as long as he or she would if the condition were treated. Be aware that any sedative drugs, whether purchased over-the-counter or prescribed by a doctor can be life-threatening. In all types, depressed respiratory or brain activity is involved. Sedatives further depress activity in the respiratory systems. Alcohol consumption should be avoided for the same reason. It acts as a sedative and it relaxes the muscles surrounding the throat. If you have yet to be diagnosed, but believe that you may suffer from the condition, there are certain symptoms to look for. Loud snoring is not necessarily a symptom. The symptom to look for is when snoring and breathing stops. Your sleeping partner is most likely to be aware of this sign. Spouses are often concerned about sleep apnea death. Watching or listening to their partners struggle for breath is hard on them, too.